Construction of the Fitzroy Street Streetscape Upgrade has begun and is scheduled to be completed by November 2015. 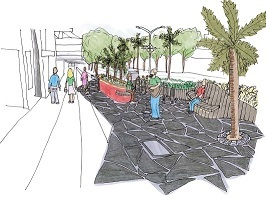 (18/08/15) The south side of Fitzroy Street between Grey Street and Jackson Street will be improved with new landscaping, lighting, street paving, furniture and artwork. Construction activities will be carefully minimised to manage disruption. Access to businesses on Fitzroy Street will be maintained at all times during the work.